As a graduate student attending the 1978 ASHA Convention in San Francisco, I received my first introduction to personal FM systems. At the trade show, a local manufacture was offering trips to see their facilities. So I boarded the bus for my first sight visitation, all the way to Petaluma in the North Bay, arriving at the head offices of Phonic Ear. Phonic Ear was a pioneer in the field of personal FM devices and it was a great early introduction to the world of assistive listen technology. Phonic Ear, in 1968, was the first company to successfully market a personal FM system to support children with hearing loss. A true wireless system, it offered students and teachers freedom of movement and significant benefits for accessing instruction. This first system operated in the commercial FM 88-108 MHz band. This commercial band was subject to significant interference. Phonic Ear and their allies, mainly teachers and parents, were successful in 1971 in getting the FCC to allocated the 72 to 76 MHz band for use for audio enhancement devices for hearing-impaired individuals.9 Although not completely without interference from emergency response agencies and airports this was a major improvement. The FCC added the 216 to 217 MHz band in 1996. The shorter wavelength provided further reductions in interference and opened the door for technological breakthroughs in miniaturization. 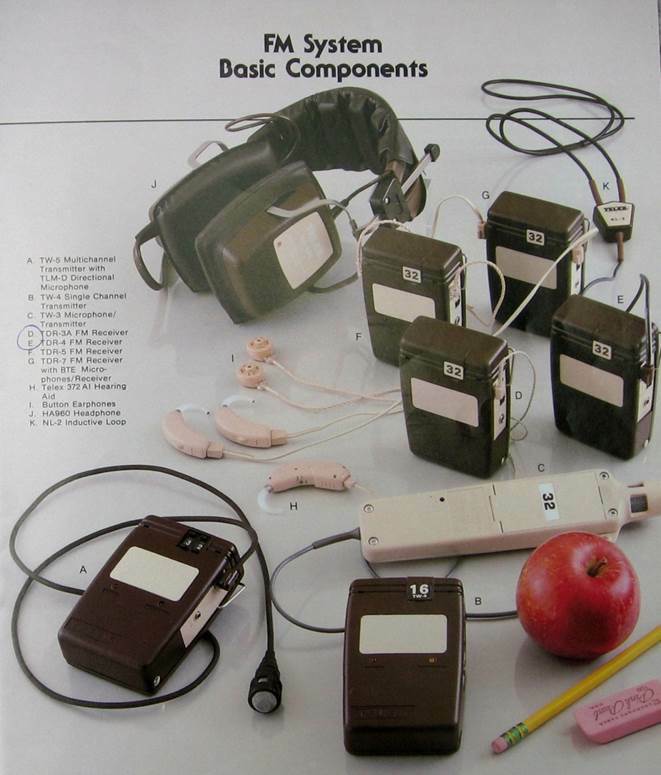 The early FM systems where similar in size and weight to a body-worn hearing aid. They utilized button receivers and fixed BTE microphones. But this made them difficult to fit on infants and young children. Belts, harnesses, and cables all contributed to the reluctance of older children to wear their equipment; it wasn’t very cool. Keeping everything in good working order was also a considerable challenge. Still the benefits outweighed the problems and FM systems continued to increase in use and development. In 1979, Phonic Ear and Phonak collaborated in the development of the first direct audio input (DAI) system. This allowed the individual to be fit with a number of manufactures’ hearing aids equipped with DAI. Phonic Ear, Telex (Figure 1), Sennheiser, Phonak and others were all contributors to the advancement of the body worn systems. Features like multi-channel selection, gain and frequency control, directional and boom microphones, auxiliary audio input, and indicator lights were welcome additions. Figure 1. Telex Body Worn FM w/BTE microphones (courtesy of Telex). Figure 2. Phonak MicroLink ear level FM receiver (courtesy of Phonak). In 1996, Phonak released the first miniaturized ear level FM receiver called the MicroLink (Figure 2). Although built only for use with Phonak hearing aids it did mark a significant change in the wearability of the technology. 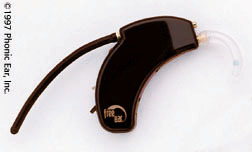 Phonic Ear in 1997 introduced the first hearing aid with integrated FM. However, due to the antenna protruding from the BTE and single channel capabilities, it was not widely accepted (Figure 3). In 2000, Phonak released the first universal ear level receiver, the MLx. With the appropriate audio input shoe the MLx could be worn with any DAI-equipped hearing aid. Due to the smaller size, and elimination of cords and cables, the body-worn style FM system began to decline in use. In 2003, Phonak released the first universal multi-channel FM receiver, further increasing the flexibility of the ear level receiver for schools. Figure 3. 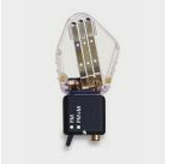 Phonic Ear Free Ear integrated FM receiver (courtesy of Phonic Ear). At about the same time as the release of the ear level receivers, companies started to release transmitters for the adult user. 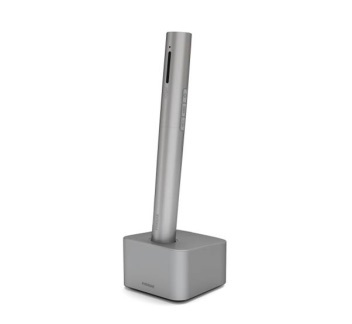 These sleek devices allowed the user to select different microphone modes suited to the changing listening environments that they encountered. In 2003, Phonak launched the SmartLink, the first FM transmitter to incorporated Bluetooth technology, thus ushering in the era of cellphone compatible devices (Figure 4). Figure 4. Phonak SmartLink FM w/Bluetooth (courtesy of Phonak). In 2013, Phonak released a Digital Modulation (DM) technology called “Roger.” Although not the first DM system in the market, this dynamic digital streaming system significantly improved benefits for users in high noise conditions. Linda Thibodeau repeated her comparative study and reported improvements of 55% in high levels of noise over traditional FM, and 35% over Dynamic FM.12 Linda noted that the hearing impaired group actually out-performed the normal hearing control group in high levels of noise when using Roger technology. DM technology also eliminates the need for FM channel management, the bane of educational audiologists, in schools. Broadcasting on the 2.4 GHz band, the digital format is less likely to encounter interference, an issue that still remains for FM use. Although we are unlikely to see FM devices disappear completely, the new DM type devices are now the bench mark for personal listening systems (Figure 5). A number of companies are active in the development of digital streaming remote microphone technologies, which will further reduce the place that personal FM systems have held throughout my career. Farewell my old friend, you served us well. Figure 5. Roger Pen DM transmitter (courtesy of Phonak). Crandell CC and Smaldino JJ. Classroom acoustics for children with normal hearing and with hearing impairment. language, speech, and hearing services in schools ASHA 2000;31:362–370. Available at: http://lshss.pubs.asha.org/article.aspx?articleid=1780236. Hood LJ, Wilensky D, Li L. and Berlin CI. The role of FM technology in the management of patients with auditory neuropathy/dys-synchrony. Access: Achieving clear communication employing sound solutions; 2003. Available at: https://www.phonakpro.com/content/dam/phonak/b2b/Events/conference_proceedings/1st_fm_conference_2003/2003proceedings_chapter9.pdf. Tharpe AM, Ricketts T and Sladen D. FM systems for children with minimal to mild hearing loss. Access: Achieving clear communication employing sound solutions; 2003. Available at: http://www.phonak.com/content/dam/phonak/b2b/Events/conference_proceedings/1st_fm_conference_2003/2003proceedings_chapter20.pdf. Hornickel J, Zecker SG, Bradlow AR, Kraus N. Assistive listening devices drive neuroplasticity in children with dyslexia. Proc Natl Acad Sci U S A. 2012;109(41). Available at: http://www.pnas.org/content/109/41/16731.full. Schafer EC , Mathews L, Mehta S, Hill M, Munoz A, Bishop R, Moloney M. Personal FM systems for children with autism spectrum disorders (ASD) and/or attention-deficit hyperactivity disorder (ADHD): an initial investigation. J Commun Disord 2013;46(1):30–52. Available at: https://www.researchgate.net/publication/232811709_Personal_FM_systems_for_children_with_autism_spectrum_disorders_ASD_andor_attention-deficit_hyperactivity_disorder_ADHD_An_initial_investigation. Paccioretti D and Pichora-Fuller K, et. al. Classroom use of FM systems with headsets by children with mild, fluctuating or unilateral hearing loss. Canadian Acoustics/Acoustique Canadienne 1997;25(2):3–12. Available at: http://www.google.ca/url?sa=t&rct=j&q=&esrc=s&source=web&cd=1&ved=0ahUKEwjn4PqEzKDOAhXGPRoKHdUzBSwQFggbMAA&url=http%3A%2F%2Fjcaa.caa-aca.ca%2Findex.php%2Fjcaa%2Farticle%2Fdownload%2F1071%2F799&usg=AFQjCNFCTrCTVXRRjAtrTKvE1y2PC8s5Tg. Anderson K, et. al. Speech perception benefits of FM and infrared devices to children with hearing aids in a typical classroom. Lang Speech Hear Serv Schools 2004;35:169–84. Available at: http://lshss.pubs.asha.org/article.aspx?articleid=1780351. Wolfe J, et. al. Evaluation of speech recognition in noise with cochlear implants and dynamic FM. J Am Acad Audiol 2009;20:409–21. Available at: https://www.researchgate.net/publication/257888357_Evaluation_of_Speech_Recognition_of_Cochlear_Implant_Recipients_Using_a_Personal_Digital_Adaptive_Radio_Frequency_System. Ross M. FM systems: A little history and some personal reflections. Keynote address. Access: Achieving clear communication employing sound solutions; 2003. Available at: http://www.phonak.com/content/dam/phonak/b2b/Events/conference_proceedings/1st_fm_conference_2003/2003proceedings_section1.pdf. American Speech-Language-Hearing Association. Guidelines for fitting and monitoring FM systems. ASHA Desk Reference; 2002. Available at: http://www.asha.org/policy/GL2002-00010/. Thibodeau L. Benefits of adaptive FM systems on speech recognition in noise for listeners who use hearing aids. Am J Audiol 2010;19:36–45. Available at: https://utdallas.influuent.utsystem.edu/en/publications/benefits-of-adaptive-fm-systems-on-speech-recognition-in-noise-fo. Thibodeau L. Comparison of speech recognition with adaptive digital and FM remote microphone hearing assistance technology by listeners who use hearing aids. Am J Audiol 2014;23:201–10. Available at: https://utdallas.influuent.utsystem.edu/en/publications/comparison-of-speech-recognition-with-adaptive-digital-and-fm-rem. Dan Paccioretti is an audiologist with Phonak Canada. He is the Western Canada Pediatric and Roger sales manager. Dan has over 37 years’ experience working with FM technology for both children and adults.